I really love novels of strong historical women. 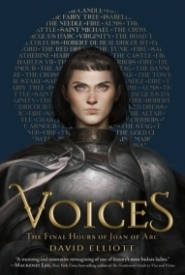 In this case, this novel is about Joan of Arc. What makes this novel extra special is it is told in a poetry style used in Medieval times. The poem pieces are from not only Joan of Arc's point of view, but others, including the sword she carried. Joan was often misunderstood during that time and there were those who considered her evil for having the nerve to stand up and dress like a man and fight in a battle. Her unwavering faith to her God and saints led her to battle and to help the French people. She was strong, courageous, and devoted to her cause even when some looked to destroy her. The poetry shows her struggles, unyielding faith right to the very end. At the end is a listing of the different poetry types that were used throughout this novel. This poetry style would have been familiar to Joan of Arc. They add to the realism and strength of this amazing novel. Inspiring glimpse into Joan of Arc and what might have been her reflections of her life right before her death. Her courage, faith, and unrelenting devotion to a cause are felt throughout this novel. Totally recommend.